Well, today is the second day of sneak peeks from REVERSE CONFETTI. We have some pretty inspiring projects to show off today as we continue to share our new stuff available on February 8th! The new set we are featuring today, HIPPITY HOPPITY will make your heart melt! 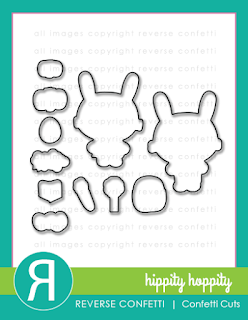 HIPPITY HOPPITY will be a must have set, along with the coordinating HIPPITY HOPPITY Confetti Cuts! I kept a soft color scheme with this card, a simple layout, and colored my sweet bunny girl with Copic markers. Yes, that only took a minute, since there's not a whole lot to color--benefit when you want to make something super quick and simple or make multiples. 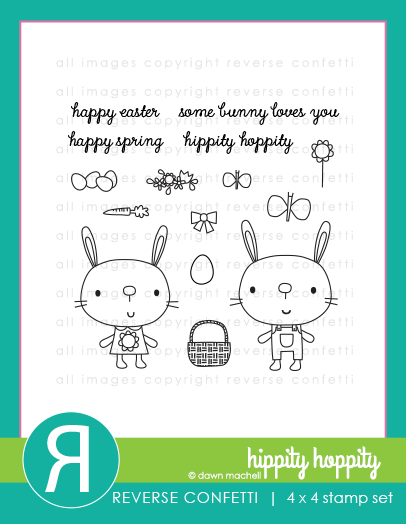 Somebunny loves you--if you're a local fan, this is one of the cards we'll be making in my next 'Fetti Fans Workshop at The Little Blue House! Wanna come play? Ok, that's about all from me today! Come visit me again tomorrow! We have lots more sneak peeks to share tomorrow. Then, everything will be available on the 8th. Don't forget that Jen has a link list going daily (FEBRUARY 5-8) for all the sneak peeks over on the REVERSE CONFETTI blog HERE. Leave a comment on each of the designer's blogs for a chance to win a $15 gift certificate. Comments will close at noon CST on FEBRUARY 7th and the winner will be announced at 5pm on FEBRUARY 7th on the Reverse Confetti Blog and our Facebook page. In addition to having a chance to win just by leaving a comment on the sneak peek posts, we are also running a Facebook promotion for a chance to win a $15 gift certificate. After you are done checking out the sneak peeks, head on over to OUR FACEBOOK PAGE and look for the promotional graphic. Oh, this is so so cute!! Love the layout of the card. I am really lovin all the new products!! Thank you for the inspiration!! Oohh..such a darling card! Bunny is too adorable! so cheerful looking and sweet! This is super sweet! Love all the little details. Gorgeous card, Susan! I just LOVE your colorful style! Your cards always make me smile, Susan. Great layout. I love it. Love your adorable card! Love the layout and the colors! So cute! Your card is adorable and just shouts Spring! A lovely thought after we just received our first "real" snow here in Western Mass. yesterday. I can't wait to add this new Confetti goodness to my supplies! Great springy colors, your card is soo cute! Cute, cute, cute! The details are fabulous-the little carrot and the bow are way too cute. Really cute card. Great job! Such a bright and cheerful card, LOVE this!!! Susan, this card is A-D-O-R-A-B-L-E! I love, love, love the color combination and really hope we make this one in class! Cutest bunny ever! Love all that layering on your sweet card! This card is just too sweet Susan! Love all of the great dimension you added! so, so sweet! love the springy colors. Super sweet card! The sweet bunny is adorable! TFS Susan! So spring-y! Glitter dot background is a great touch! Pretty colors and lots of layers - just beautiful! Oh my gosh! Sooooooo fun! Amazing dimension...and spunky colors. Love all of the different elements! AdorBle! I can feel spring around the corner when I look at it! CUTE!!!! love that bunny stamp set. The little dress on the bunny is so cute :) What a cheerful color combination! I love this card. It's beautiful. Love all those terrific layers!